Are you trying to beat the "days-on-market averages"? In a slowing economy and housing slump, houses can languish on the market for months, even years. In desperation, home owners usually are advised by their agents to drastically lower the price. That is a loss of income for both the seller and agent, whose income is based on the selling price. But there is another very viable alternative - "staging" the home for sale. Just think of home staging as a merchandising method. The goal is to capture the minds and hearts (and get the bids) of potential buyers. The more interested buyers a seller gets, the higher the selling price. Crucial to this whole process is to make the best impression possible - not only when the buyer arrives at the property, but also when the buyer leaves. 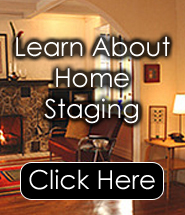 A stager who has home staging certification should be ideal to help out. "There's a big difference in how a person lives in a home and how they should present it for market,” says Barbara Jennings, who is a leading staging trainer in the nation and CEO of Decorate-Redecorate.Com. She has created and developed one of the strongest certification programs in the country, being the only organization who requires candidates to pass a lengthy exam and submit a portfolio of work before gaining her prestigious designation of Certified Staging Specialist. While some organizations merely ask a person to attend a 3-day or 5-day seminar, or join an online membership site to attain home staging certification, Jennings feels that is not adequate to serve and protect the needs of the consumer who places such an important asset in the hands of the stager to manage. If the stager is not well trained in the philosophy and techniques of home staging, both the seller and the agent come out on the losing end and the house continues to languish on the market until a significant price reduction becomes mandatory. A recent HomeGain Survey found that home staging paid for itself — and then some — by boosting the final selling price. An even more recent survey found that homes listed for sale without staging spent an average 4.5 months on the market; homes staged before listing spent less than 1.5 months on the market. The average time for a staged home to reach a ‘sales pending’ status was about a week. Now those are pretty good stats and a pretty good record over several years and different parts of the country. Stagers are naturally going to view the home with the same kind of eyes and attitude that a buyer would have, something the seller will never be able to do. Detachment is the key and sellers are too emotionally involved with the home and the way they decorated it to separate themselves enough. This is yet another good reason for hiring a professional to manage the project. Look for a stager who has attained home staging certification for the best results. Take a few moments to check out all of the valuable information you can find at www.decorate-redecorate.com. Whether you are interested in decorating and preparing a house, or finding new and wonderful ways to enhance a space you wish to living in, you'll find lots of great resources at Decorate-Redecorate, including an online directory of stagers and redesigners.